Milodon’s 45+ years experience of manufacturing oil pans truly shows! These oil pans fit and work better than any other we have tried. 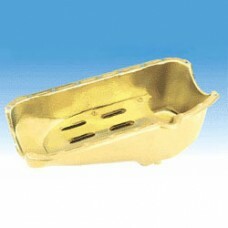 Specifically designed for applications that require improvements over stock yet do not want a high cost race pan. Whilst appearing stock on the outside this pan contains sufficient horizontal baffling to 100% control 5 qts of oil. Internal mounted windage tray provides increased power yet requires no block mounting to install, finished in Milodon’s distinctive gold irridated finish. Designed for Small Block Chevrolet with left hand dipstick (next to cylinder head) (1955-79). Pan capacity 5 US Qts. 7 1/2-inch sump depth. Recommend pick up MIL18307.